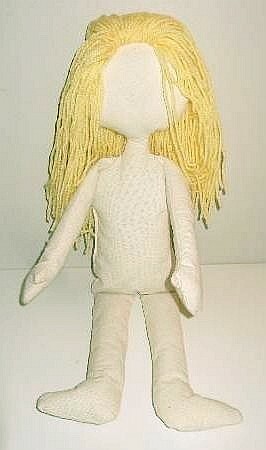 We are going to make a doll today! Meet Eleanor our bright and cheerful KKC rag doll. Follow the step by step instructions on how to make her. You can make your own character if you like. Use different colours of fabric for different nationalities. 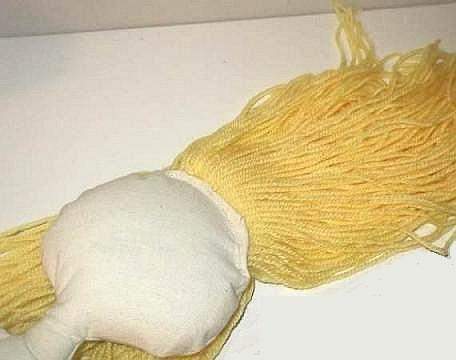 You can even make one from a bright colour with contrasting woolen hair. 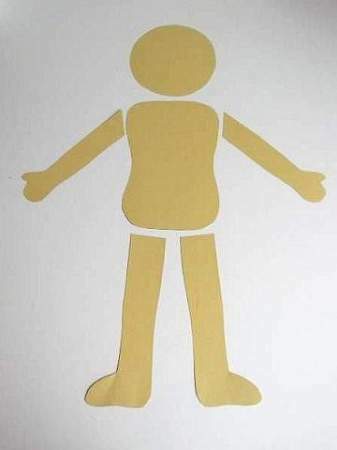 Go now and print off your free rag doll patterns and come back here for the next step. 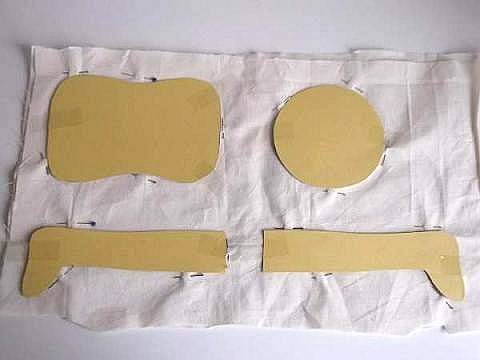 Pin the 6 pattern pieces onto your doubled fabric and cut out adding a 1/2 inch seam allowance around all of them. 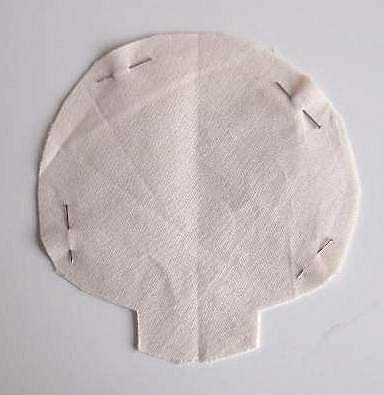 Fold the head in half and draw an L shape like you see in the picture, then cut it out. 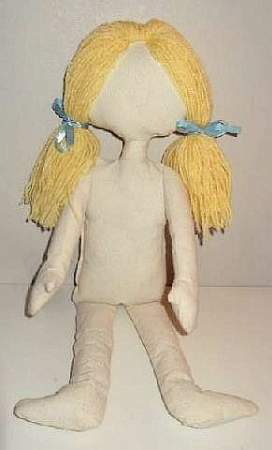 This will make the neck and make a doll face look chubby and cute. 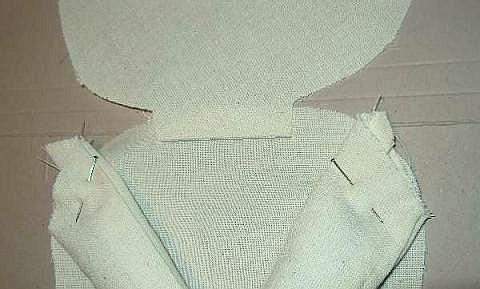 Now stitch the arms and legs together leaving a 1/2 inch seam allowance, but leave the tops open. 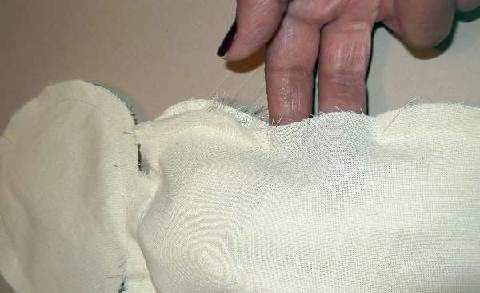 It is important that you snip inside the bends and joined seams close to the stitching. 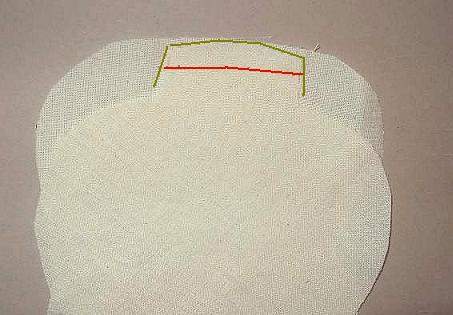 If you fail to do this the seam allowance will stop you from pushing the shape right out. 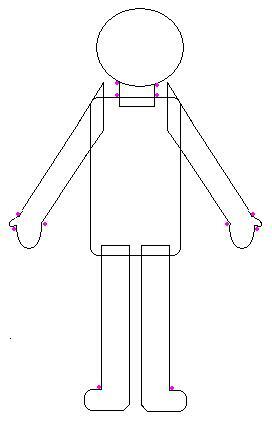 See the pink dots in the picture on the right, to know which places you need to make the snips. 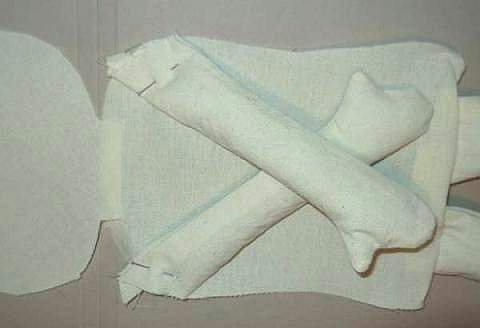 Use the skewer to gently poke the limbs through to the right side and stuff them a small piece at a time with polyester filling. 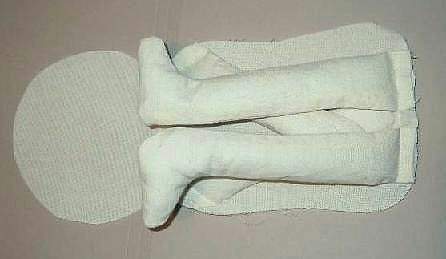 Make sure that you fill the toes and the heal area properly but don`t over stuff. 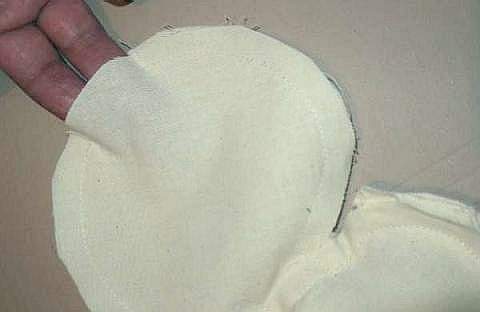 Polyester filling can be recycled from old pillows. Make sure you wash them thoroughly in a washing machine and add some fabric softner to freshen it up. 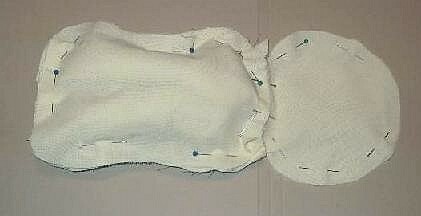 At this stage you insert a neck support using the 5 inch dowel. Enter in either gap and push it half way into the body and half way into the head. 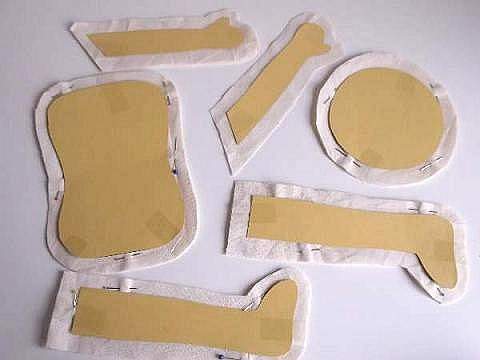 Now push polyester filling, as much as you can squeeze in, inside the neck area, padding all sides. This should tightly secure the dowel and stop it from coming out. Now fill the body and head. This time, stuff them quite well with lots of filling. When they are packed full, stitch up the holes. The head should be firm not floppy like the arms and legs. 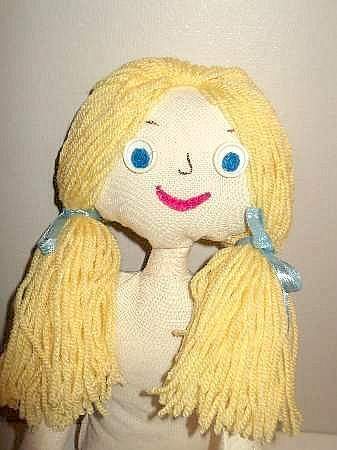 When I was young I used to make my own dolls from rags and I always made them so that their hair can be platted, bunched and even cut. So I haven`t changed it seems. You need a 10 to 12 inch piece of cardboard about 7 inches wide. 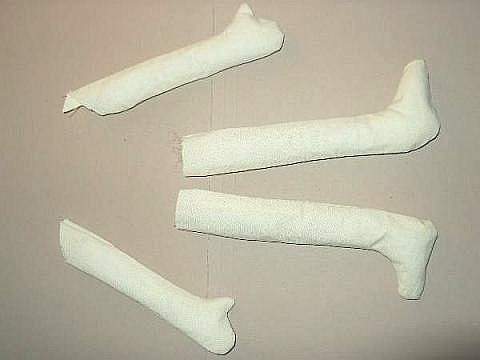 Wrap a thick layer of wool around it and then cut through 1 end. 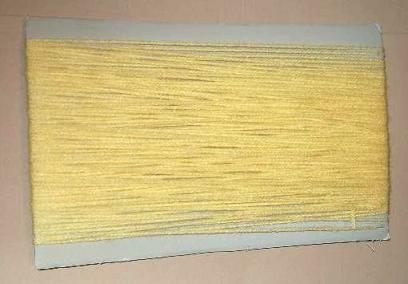 Hold the middle of the wool at the other end and place over the top of the head. Half in front of the face and half down the back of the head. 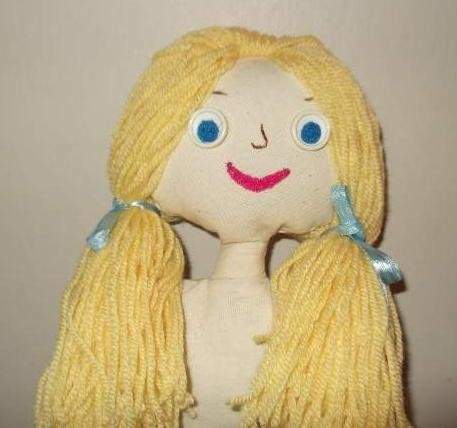 At this point the front and the back of the doll are the same so it doesn`t matter which side you choose. 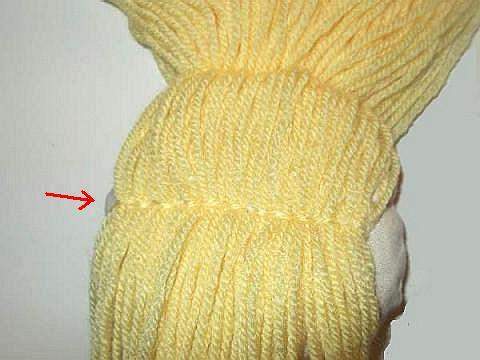 Stitch the hair along the seam at the top of the head several times. Do not turn the doll over! 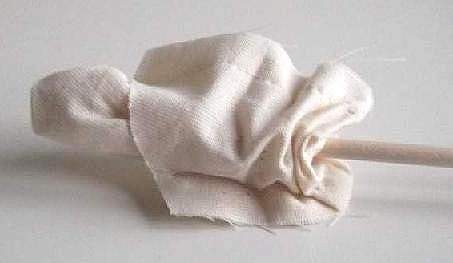 Thread the darning needle with a length of the same wool and half way down the head back stitch the wool onto it. 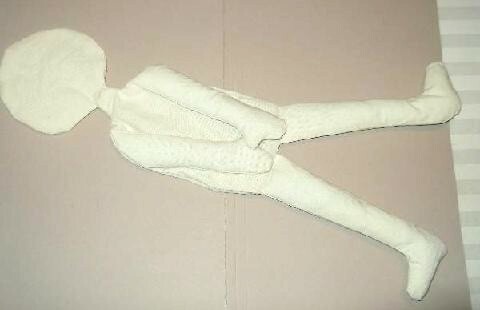 Now you can take the wool covering the face and fold it over to the back. She is looking good! But she needs a happy face. Cut the piece of ribbon in two and bunch the hair to the sides out of the way. Now you are ready to make a simple face. 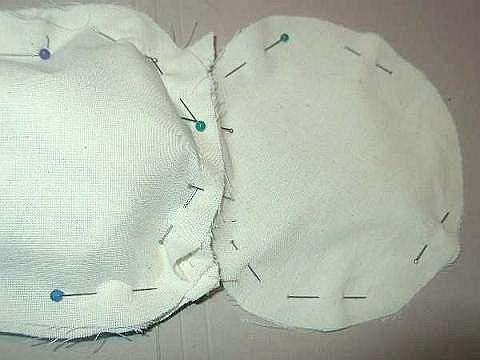 Stitch the buttons on for eyes. Cut 2 very small circles from the blue felt for the eye pupils and glue them over the holes. 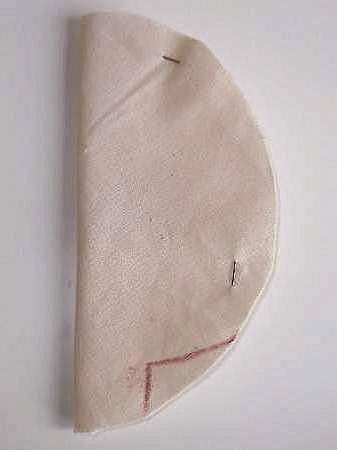 You can just sew a curve for the mouth but I used a piece of felt and then stitched along it for a good effect. The eyebrows and nose are drawn in with a felt tip. Ok She is finished. 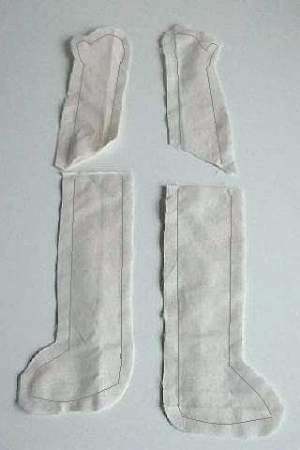 All you need to do now is make a doll skirt outfit for her, a doll tunic top that looks gorgeous and... here is how to make her bloomers and homemade dolly shoes. Download the free pattern to make doll clothes for Eleanor.